Do you know you can subscribe to a monthly plan of data bundles (Internet Plan) from any of the networks and use the same subscription on as many phones as you wish. You can even call up your friends, gather N1000 equally (N200, N500 or as the case may be) and subscribe to a data plan only to be shared on all your phones. 1- A Wireless (WiFi) Enabled Nokia Phone. 2- All other phones must have Wireless (WiFi) too. 3- And finaly, an active data subscription. Once, you have gotten all these; you are good to go. To start, simply visit Nokia OviStore. You can visit the Nokia Ovistore application on your phone and do the search querry for JoikuSpot and in few minute, the application comes up and you can then click on it for direct download or, using your desktop computer or laptop, visit www.ovi.com and navigate the portal. JoikuSpot is a powerful application that does wonders- an application that turns your mobile Phone into a WLAN Server so that other Device can connect to the internet using your access point or server! Please note that in most websites, you would only have the opportunity to download JoikuSpot light which is not fully featured and becomes useless in few days to come as it is; JoikuSpot Light, a trial version of the application. Once you have downloaded and installed the application, JoikuSpot in your phone, you should be able to locate its icon on your phone by going to the folder where application are located by default on your phone or wherever it is. Locate it and click on it to open. Once it opens, it will ask if you wish to share your internet connection. Click YES and select the access point you wish to share then; JoikuSpot begins. 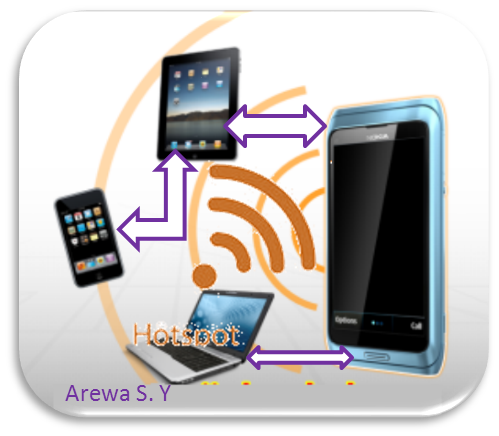 Once JoikuSpot is initiated, other WiFi enabled phones and devices can then search for your access point and connect using your phone at no extra cost. In case you are reading this article from a feed or an external link that prevents you from clicking links and others, visit http://aryk.tech now for more and others.